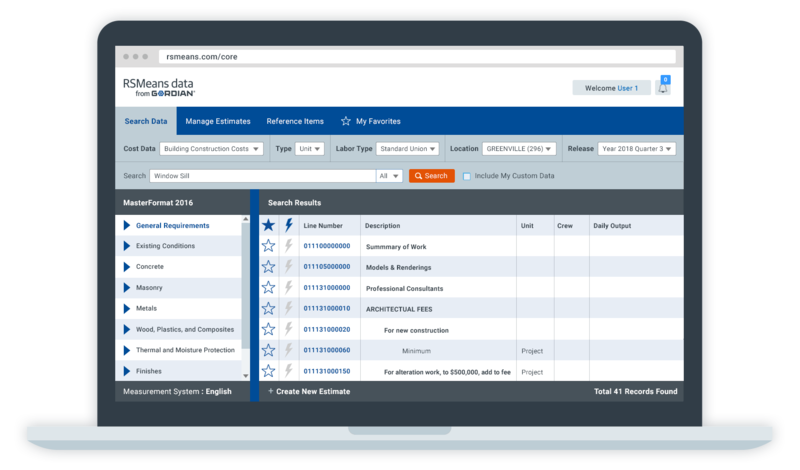 The Core tier of RSMeans Data Online provides reliable construction cost data along with the tools necessary to quickly access costs at the material or task level. Users can create unit line estimates with RSMeans data from Gordian and share them with ease from the web-based application. Search – Quickly find the item you need with intuitive keyword search or through a browsable MasterFormat® structure. Save frequently-used items to your favorites list for easy access. Estimate – Build out detailed unit estimates with the basic estimator tool equipped with inline editing capability for quantity, overhead and profit. Adjust the time and location of your estimate and your prices update automatically. Share – Directly share from the application via convenient options, including a customizable PDF with your logo and Microsoft Excel® export for easy manipulation and sharing offline. Comprehensive dataset for commercial new construction. All-inclusive dataset for anyone dealing in the upkeep and improvement of existing commercial buildings. All-inclusive package for anyone dealing in the upkeep and improvement of existing commercial and multi-family residential buildings. Description: Open Shop Wage Rates are available to RSMeans Online users who require instant access to detailed costs for more than 24,000 building component prices, including material, labor and equipment plus productivity information including labor hours and daily output for open shop crews.